Ever run out of batteries unexpectedly? Annoying, isn't it? Now you can say goodbye to weekly battery changes with the Gator 380 Headlight! The Gator 380 bike safety light is super bright, Never worry again about riding in the dark! The Gator 380 bike light SHIPS FROM THE USA ONLY. Blitzu is the only authorized manufacturer to sell this product. ✅ DAYTIME NOTICEABLE TECHNOLOGY - Be visible when it matters the most. Did you know 75% of cycling accidents happen in daylight? The GATOR 380 features the latest technology to keep you visible NOT ONLY at night but also at daytime. It produces an extraordinarily wide-beamed of light which is eye-catching from all angles. Keeping you and your LOVED ONES SAFE at all times! ✅ SAVE YOUR MONEY AND HASSLE - Never Waste Your Money on Batteries again! Save the Hassle to Replace Batteries Every Week, It's a WIN-WIN! The front and back light are both USB Rechargeable. They charge from your computer or any device with a USB port. 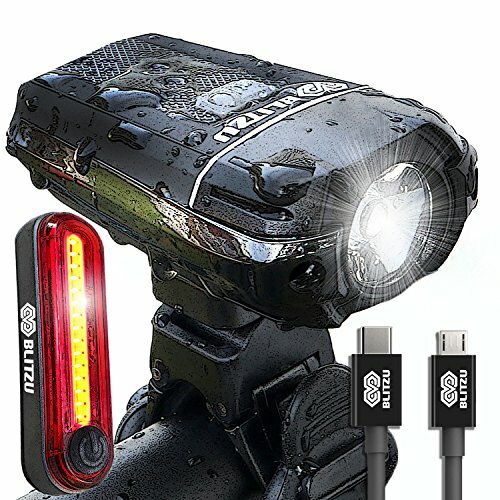 Takes 2 hours to fully charge and has a Runtime of 2+ hours on the highest setting, making it the BEST SELLING bike light on Amazon! DON'T WAIT, GET YOURS TODAY! ✅ FREE USB RECHARGEABLE TAIL LIGHT - This set comes with a rechargeable headlight and a rechargeable tail light (FREE FOR A LIMITED TIME) making your bicycle stand out with an unmatched 360º visibility so you and your loved ones are safer in any low light conditions. Instantly improve your visibility & safety with our Ultra Bright LED bike light. You will be shocked and amazed at how bright it is! HURRY, Click the ADD TO CART Button Now! ✅ ORDER NOW WITH NO RISK! 100% SATISFACTION GUARANTEE - The Gator 380 is the BEST SELLER on Amazon for a reason! BEWARE OF CHEAP IMITATIONS. Only Gator 380 sold by BLITZU (and Fulfilled by Amazon) are guaranteed to be the top quality, with excellent customer service. Keep one set for yourself and share one with a friend or family member. Every light purchase comes with a ONE-YEAR HASSLE-FREE WARRANTY and friendly customer service provided by BLITZU, Proud to be a U.S based company.